PORTABLE: Small folding size with storage bag, can be put in backpack. Easy to adjust to 3 different length, 24.8inch, 18.5inch, 13.38inch. 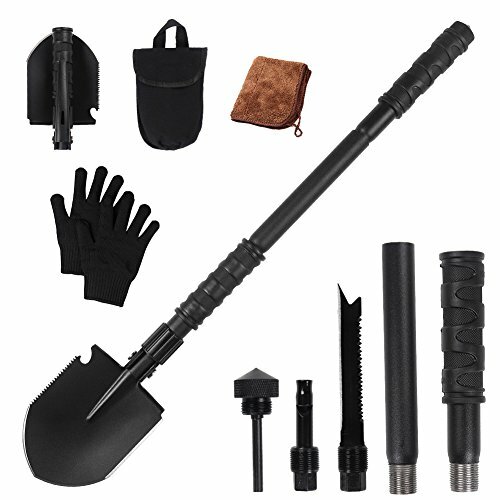 SMART DESIGN: All tools of this folding shovel comes in a carrying pouch , amazingly compact and portable, the shovel folds up and fits in this high quality portable pouch to carry at your side, and thus makes this tactical shovel the best emergency tool. MULTI-FUNCTION: digging, sawing, chopping, cutting, picking, prying, hammering, bottle opening, shoveling.High quality steel material,can peel animal skins,scale fish phosphorus,cut the rope;Magnesium and whistle:4.5cm magnesium rod,easy to make fire. APPLICATION: The must-haves for surviving in the outdoors, like camping, fishing, cooking meal, exploring, traveling, hiking. If you have any questions about this product by Trekoo, contact us by completing and submitting the form below. If you are looking for a specif part number, please include it with your message.